Tuesday October 30, 2018: Michael begins to deal with his grief, Lulu is shocked to see Britt out, Chase meets Willow Tate, and Ryan has murder on his mind. At Sam’s place, Sam feels they should show Jeanette’s incriminating letter to Margaux and she can either choose to send her mother to prison or back off. Jason agrees and if Margaux covers for her mother then they can nail her. 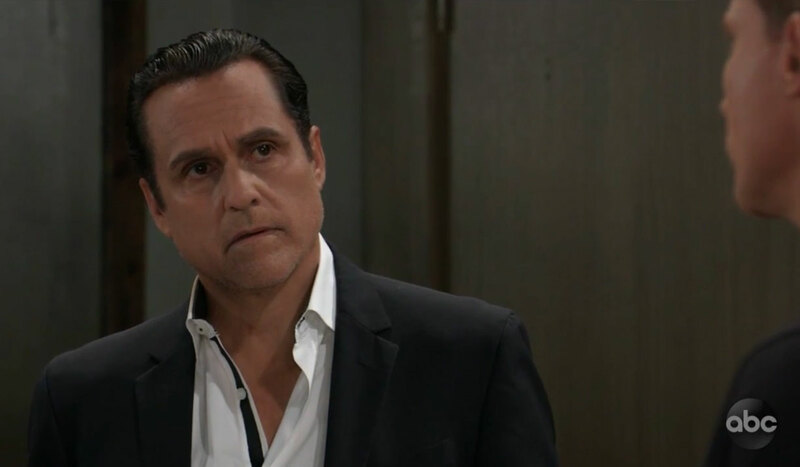 Sonny worries it won’t matter to Margaux because it was he who pulled the trigger. He thanks them for what they’ve found, but he is going to take things from here and confront the DA on his own. Sonny leaves and calls Dawson to meet and have things out. 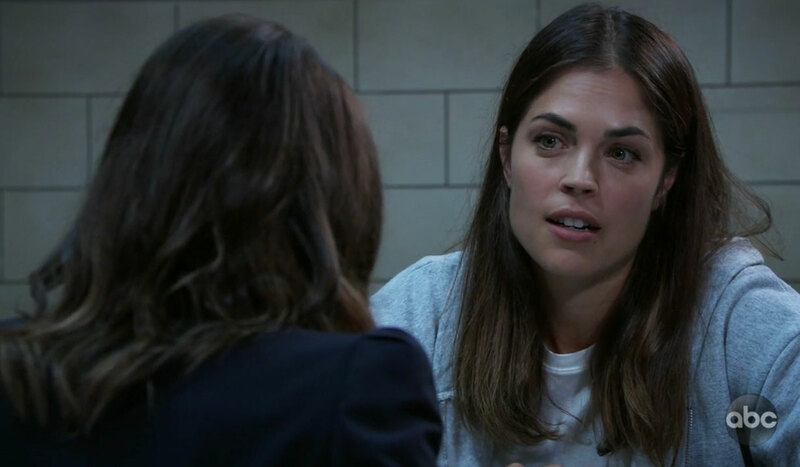 At Pentonville, Britt wants a much better offer from Anna and asks for her medical license to be reinstated, which Anna refuses to allow what she did to Lulu. Anna tells her to take her deal or leave it, so Britt accepts it but does have a request. Lulu runs into Michael at The Floating Rib and sees something is troubling him. He admits he’s struggling but promises he’ll be okay. He leaves and Peter joins Lulu. They discuss work and her articles on the Chamberlain murders when Lulu looks over and is stunned to see Britt with Anna and Finn. Britt is chowing down on ribs and throwing back some margaritas when Lulu grabs the pitcher and pours it over Britt’s head. Anna, Peter and Finn break up a fight between the two, and Lulu introduces Peter to his sister Britt. After cleaning up, Britt thinks she owes Peter a drink for taking care of their father. Peter wonders why she’s out and with Anna. Anna takes him to another room and explains she’s using Britt to lure Obrecht into a trap, but she needs him to make sure this stays out of the paper and Lulu keeps quiet. At the bar, Mary Pat tells “Kevin” she knew they hadn’t seen the last one of another. 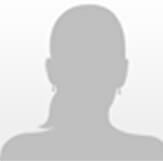 “Kevin” believes they have things to discuss in private and suggests she meet him at Pier 55. 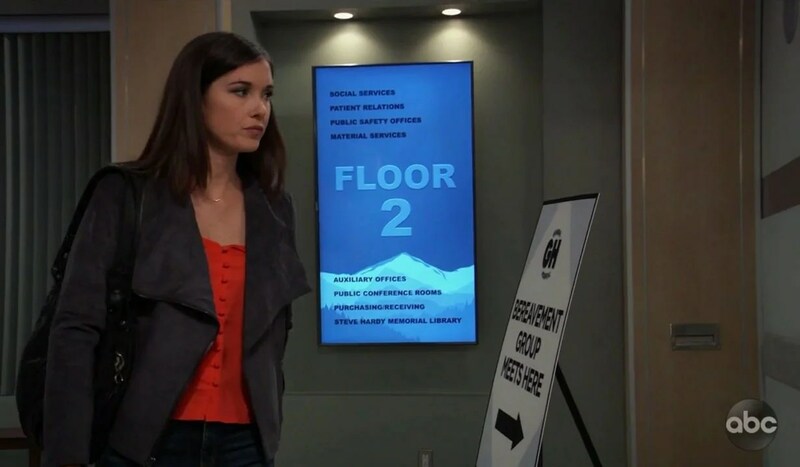 At GH, Laura and Carly discuss their Ferncliff trip, and Laura promises her they’ll make things right for the other patients there, including her neighbor. Michael arrives to speak to his mother, and in private he fills her in on the DA confronting him and throwing Sonny’s murder of AJ in his face. Carly can’t believe Dawson would do that to him with everything else he’s dealing with. Michael doesn’t think he’s actually dealing with his son’s death and admits he thinks about his son all the time. He needs to stop pretending that he’s okay and has decided to go to a grief group at GH. In a parking garage, Chase finds Willow Tate with her eyes closed in her car, which is parked in an illegal spot and suspects her of being drunk. She’s not, and is just preoccupied. When she agrees to move her car she finds it wont’ start. Down on the pier, Mary Pat cries to “Kevin” that she kept his secret and it’s not fair that she’s been fired. He reminds her that she tortured patients. Mary Pat wishes people would stop throwing around that word, and she threatens to tip off The Invader about the maniac he is hiding at Ferncliff. He warns her that could set Ryan off, but she thinks he can’t hurt her when he’s locked up in there. Ryan gets a phone call from Laura, which he ignores as Mary Pat demands “Kevin” take care of her for her silence. She wants a job at GH, and money to spend in the meantime. He agrees but says that is all he’ll do for her. Mary Pat tells him not to be so sure because one never knows what the future will bring. She walks away, and Ryan retrieves a large hook from one of the crates on the pier and walks after Mary Pat. Back in the GH garage, Lulu finds Chase trying to fix Willow’s car engine. Willow explains she was just at GH visiting a friend when she and Chase had a misunderstanding. Lulu quickly fixes the issue with her car and lets Chase know that Willow is single and terrific. Lulu leaves, and Chase notices the grief group flyer on Willow’s car seat. He hopes she’s not ashamed of going to that meeting and suggests if she doesn’t want people to know her business then perhaps she should hide the flyer where people can’t see it. He apologizes for butting in and bids her a good evening. Later, Willow heads to the grief group at GH and is followed in by Michael. Elsewhere, Lulu meets with her mother, who asks Lulu if Kevin seemed okay to her when they talked earlier. Lulu thinks he was just plain old Kevin. Kiki asks Griffin if he’s coming back to work at GH soon. Peter, dressed as a baseball player, asks Maxie to go to a fundraiser with him. Liz knows Laura will make a great mayor. Sam and Jason run into one another on Halloween. Ryan finds Felicia and thinks it is his lucky night.